Weird YouTube videos... can't get much weirder. OMG, OMG, OMG... I've just spent 43 hours, straight, working on my blog, rebuilding a website that Google suddenly suspended (??????? on that) and marketing for the nightclub services company I'm working for. I'm exhausted. Then the urge hit me that I wanted to see if one of my posts was on page one of Google. It was about breast enhancement with Photoshop. The title of the post starts off, Weird YouTube Videos... those were my keywords for the post. And this post deserves the same lead in - Weird YouTube Videos. This, however, has to be the weirdest of the weird. You really can't get much weirdier than this - Poodle Exercise With Humans. When I first started watching this video, I was floored. Probably what was making me laugh so hard were the comments on it. There have been over 2.5 million views of this video and about 5,000 comments. This description sums it up. Really weird poodle exercise video for humans. This is a mesmerizing and frightening video. It's a word-for-word parody of Susan Powter's first workout video, featuring poodles and a crazy poodle-woman. Absolutely surreal. It was made by Nagi Noda for Panasonic. It was part of 10 films they made for the 2004 Athens Olympics. Don't worry, you don't have to go digging around YouTube to find the video or the top comments. I have them all right here - a box lunch of weirdness. You'll either laugh, gag, swear you'll never turn on your computer again or start believing in aliens. 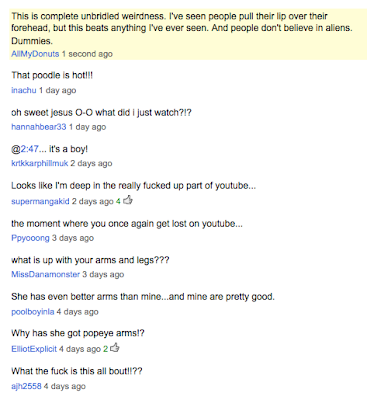 And here are the comments... Click on them to make them larger. Now you can say you've seen probably the weirdest video on YouTube. As far as weird YouTube videos go - Poodle Exercise With Humans is at the top of the list in my book. OH... and my article was on page one of Google... at the bottom... poodles at the top.